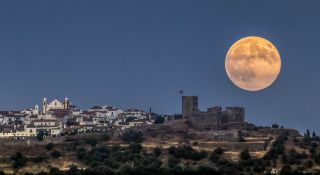 Photographer Miguel Claro snapped this photograph of a full moon over Monsaraz from Portugal's Dark Sky Alqueva Reserve Aug. 29. An epic moon hangs over the medieval Portuguese village of Monsaraz in a new twilight photograph. Miguel Claro, an astrophotographer, snapped the picture at around 8 p.m. local time (3 p.m. ET) on the night of a full moon, situated about 3 miles (4.7 kilometers) from the town and castle in Portugal's Dark Sky Alqueva Reserve. Claro's amazing night sky photography can be found at www.miguelclaro.com. Claro positioned himself precisely, far away from the Monsaraz Castle, so that the castle would take up around 0.5 degrees of diameter in his camera's field of view —the same size that the moon would appear as it rose from the horizon. Because of the careful setup, the moon's apparent size in the photo stems not just from being closer to Earth than normal. There's also an illusion at work. "Having both subjects in the same field of view creates automatically a big visual impact in our minds," Claro told Space.com in an email. Because the moon is situated so close to the castle, it looks bigger than it would if it were higher in the sky. "It seems that this moon is greater than when it is seen at the zenith, but if you try to hide it with your smallest finger on the horizon as well as at the zenith, [you see it] has exactly the same size." Skywatchers can see the same effect in the early evening just as the moon starts to rise. Editor's note: If you capture an amazing view of the full moon, or any other night sky view, that you would like to share with Space.com for a possible story or gallery, send images and comments in to managing editor Tariq Malik at: spacephotos@space.com.